Happy April! Can you believe it’s April? I love spring here in Austin, Texas because the wildflowers are out in full force. It looks like a sunset exploded on the ground with all of the colors of spring mixed together. Not only do I love looking at the beautiful flowers, I love wearing them. But wearing florals can be tricky. You want to look like an adult, not a flower girl who just stepped out of your mom’s best friend’s wedding, right? Once again I have teamed up with some of my fashion blogging friends and I am so excited! Last month we shared with you 7 ways to wear sneakers. I styled mine with jeans and a classic white shirt and also a maxi skirt outfit. Today, it’s 10 ways to wear floral this spring. 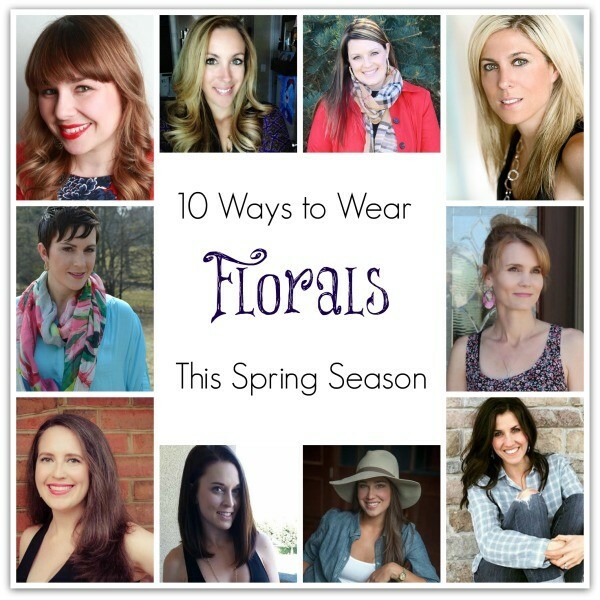 To see how they incorporated florals into their spring wardrobe, visit their links below. They all look stunning, don’t you think?! Not only do I love wearing florals, I love pattern mixing. If you follow spring fashion trends even a little, you know this is big. Would you pair stripes and polka dots? How about stripes and floral? I do like pattern mixing, but I like to do it subtly. I purchased this floral scarf at Target and instantly knew what I would wear this with. My striped dress I picked up from Kohl’s last spring. The soft florals with the dark black and white stripes compliments each other so well. It’s pattern mixing, but it doesn’t go so far that I look ridiculous! I wish you could see the sandals I’m wearing up close. They have a small gold metal bow on them. They’re from Target and they are the cutest sandals ever. The picture on Target’s website doesn’t do the bow justice, but you get the idea. The earrings I’m wearing are from Ceri Jewelry and they’re so beautiful. They’re the kind of earrings you can wear with jeans if you want to dress up your outfit a notch, or with an evening dress if you’re going somewhere fancy. I’ve worn them quite a bit and they’ve become one of my favorite pairs. 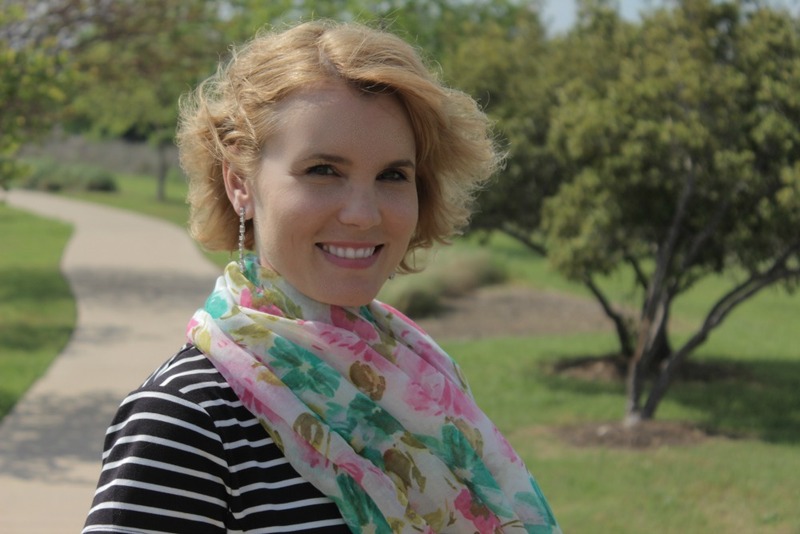 The tennis bracelet and pink ring I’m wearing in these photos are also from Ceri Jewelry. Are you ready to incorporate florals into your spring wardrobe? 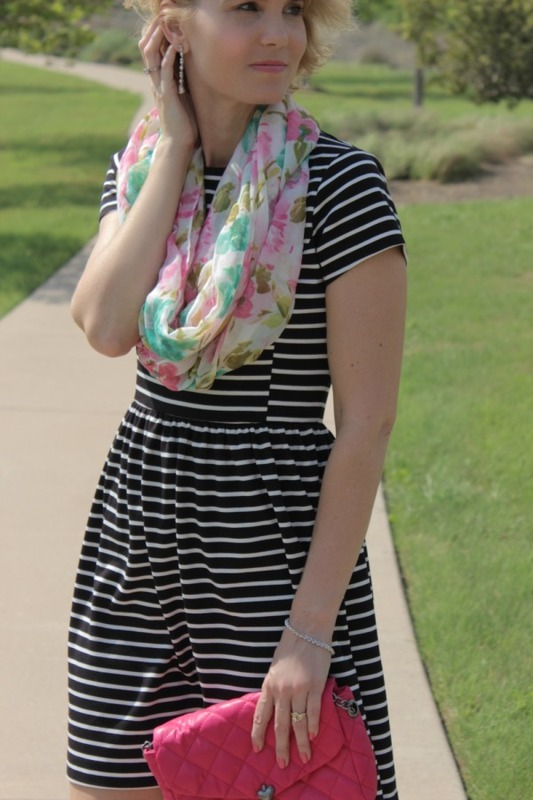 Would you do a little pattern mixing with a floral scarf and stripes? Stay tuned! I’ll have another fashion blogger collaboration coming up at the end of April! Love how you mixed prints, the stripes and floral look so cute together I never would have thought to mix them. Yes! I love a good stripes and floral pairing! Me too! It’s one of my favorite looks now. This look is so perfect for the sping!!! I want to steal it from head to toe!!! Thank you Audrey! 🙂 I’ve worn this scarf so many times. I love it! I am loving your pattern mixing! 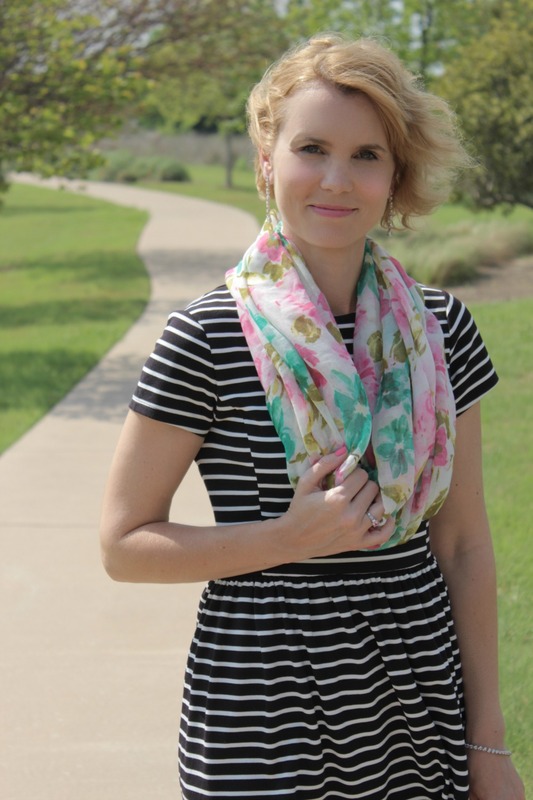 I am a huge fan of stripes and florals! I’ll have to try this mix of pattern mixing! Simply Stunning! 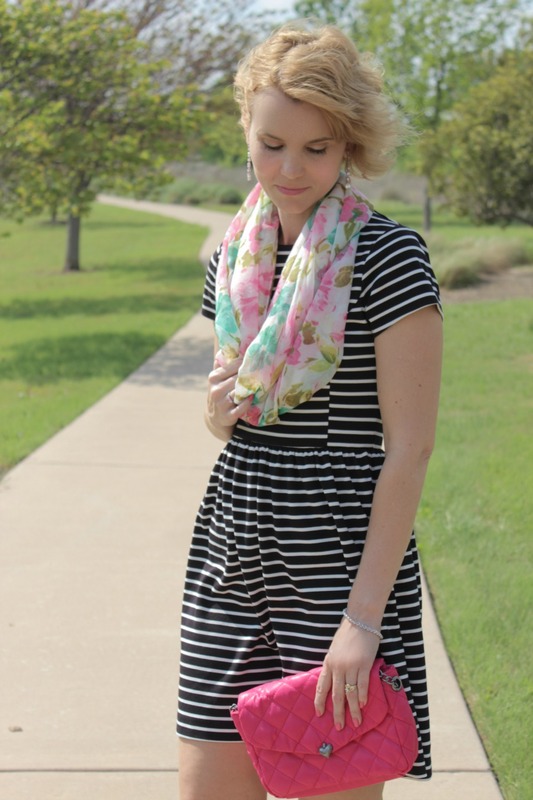 love stripes and floral…always a slamdunk You look beautiful! Totally diggin’ how you mixed the patterns – love it!! This might be my favorite of the collaborations. So pretty Julie!! Flawless beauty you have.